- Are you tired of your dull kitchen knives that cannot slice tomatoes without mashing them to pulp? - Do you remember your chef's knife being much sharper compared to now? - Has it suddenly become a challenge when carving roast, delicately slicing and chopping vegetables, or even filleting fish? - Do you feel lost when you hear about some special sharpening stone and tricky sharpening techniques? Introducing Your New Carbon Steel Honing Rod by Kuma! ✔ WORKS LIKE MAGIC - You can now recover that sharpness you thought was long gone with just a few quick strokes against your kitchen knife's blade. Meet your new honing rod from Kuma. Without it, you'll be fine. With it, you'll be a legend. 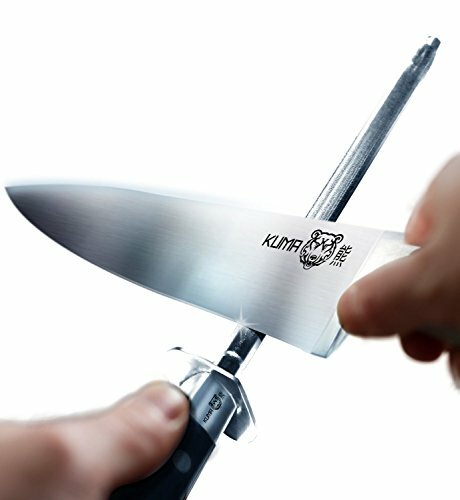 ✔ MAINTAIN YOUR SHARP EDGE - Use your honing steel to increase the lifetime and longevity of your favorite chef's knife, chopping knife, carving knife, or any other kitchen knives. ✔ EASY TO USE - We have created the best kitchen knife sharpener for YOU. Much simpler than using a sharpening stone; simply strike your blade against the steel rod a few times at a 20-25 degree angle, and your knife will get the sharp edge it deserves. ✔ HONE WITH COMFORT - Cooking should be a breeze so your sharp knife is crucial. With a smooth ergonomic handle you will always have the perfect grip on your sharpening steel. After a few strokes against your blade your knife is ready for slicing. NOTE: The Premium VG10 Japanese Damascus Kuma Chef's Knife requires a DIAMOND Honing Rod! Use Kuma Honing Rod in Carbon Steel for softer steel knives. ✔ RISK FREE: BEST HONING ROD FOR YOUR MONEY - A truly amazing honing rod should be attainable for everyone. Our carbon steel is a key material that allows us to create high quality sharpeners that are affordable to all households. Go activate your exclusive Kuma Lifetime Limited Warranty for maximum coverage and enjoy a 30-day 100% Money-Back Guarantee! If you have any questions about this product by KUMA, contact us by completing and submitting the form below. If you are looking for a specif part number, please include it with your message.